Tipton views the latest rewards testament to the dedication and vision of those offering guidance across the full spectrum of underage sides under the Portadown banner. 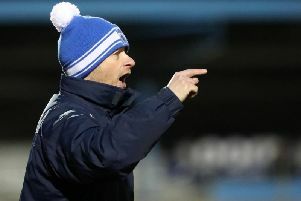 Tipton cites his own statistic of over 9,800 minutes of senior football for teenagers this season in the Bluefin Sport Championship, Irish Cup and League Cup as confirmation of the Ports pathway. Declan Dunne has enjoyed the benefits of a loan spell at Shamrock Park from Cliftonville to gain promotion into Northern Ireland under 21s and two members of Portadown Youth under 14s, Johnny McCullough and Zach Cowan, will represent the country next month at the West Ham International Cup. Portadown Youth under 13s have confirmed entry into the SuperCupNI Minor competition following last year’s appearance as one of the inaugural invitees. Former Portadown player Alberto Balde enjoyed an impressive performance with Middlesbrough under 18s in the recent Premier League Academy Cup final defeat to Manchester City as part of his development since a summer switch. Another player on the radar of professional clubs is Gerard Storey, with the teenager on trial last week at Portsmouth. “It starts with the early work put in by the coaching teams at our youngest levels then right up the system, hopefully, to the firsts, with Trevor Williamson a crucial link between the senior and youth set-ups,” said Tipton. “Youth development is at the core of how I want to approach everything and the ongoing communication with our under 20s, under 18s and beyond is vital. “We have a shared system of play to help individuals better adjust when moving up from the under 18s and under 20s and we integrate players as often as possible in training or over friendlies. “Of course, it is not about simply picking players based on age and they must show the level of maturity and mental strength required to compete at first-team level. “However, that goes back to the time spent by everyone improving not just the tactical and technical aspects but also those other skills that are needed to progress. “It is about putting your focus on those small margins to maximise the potential of the players and you can see the various rewards across the board in recent weeks.